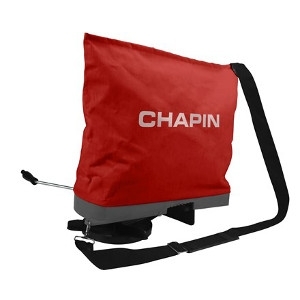 The Chapin Bag Seeder is great for small areas or hard to reach places where a push spreader or tow-behind can't go. 25 LB CAPACITY. Featuring a heavy-duty, waterproof, zipper-top bag, the Bag Seeder is compatible with a variety of seeds and granular fertilizers. An enclosed gear box for protection from the elements, an adjustable shoulder strap and a convenient application chart (located on the bottom of the spreader) make this spreader easy to use.